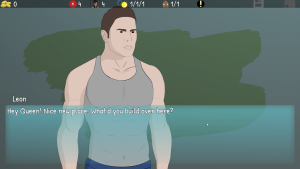 Queen’s Brothel is a RPG style game where you, Queen, try to run a successful brothel. 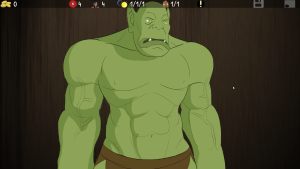 You can attract various clients through quests by leveling up certain body parts that they are attracted to. Complete quests to add more girls to your brothel!? Rooms are like traditional brothel type games. You hire girls to work in these rooms and you get paid. The difference in Queen’s Brothel is that the room can hold up to 20 girls, with a total of 10 rooms. With each day that passes, you earn a profit and the room becomes dirtier than it was the day before. A dirty room causes the profit to go down (and even into the negatives). The amount of women available to hire is dependent on how many quests you have done. Some quests give you more girls, some don’t. The max is 20 per unique area. Clicking on the women available text will show you your progress. The amount of clients available is dependent on how many clients there are in the main brothel. The only clients that affect the room clients are the non-special clients. To get 20/20 clients you need to have the maximum building upgrade for that resident and to have fucked the resident for multiple days until no more stacks occur. The current variables are subject to change. The rooms are not perfect and they will need tuning as the story progresses. The text in the room menu is clickable to show more information. Please click those to get a better idea on how the rooms work.